← Up, Up and Away ……..
Day 1. Washington Nationals vs. Baltimore Orioles! Saturday, 6/26/2010. Whew! We made it! Took the red eye and arrived 8AM yesterday, played tourist in Baltimore until our room was ready and then crashed for a few hours. Then on the highest of recommendations from the hotel staff, we went to the local G & M Seafood House and had Maryland crabcakes that probably weighed 1# each and were the best crabcakes, or actually the best restaurant dinner, I’ve had in years! Thank you G & M Seafoods for a great night out in Baltimore! lobby, boarded our bus, picked out a seat we’d claim for the next 7 days and settled in for the first leg of a 7 day tour. Destination~ Camden Park to watch our first game, Washington vs. Baltimore . We had some free time to run around Baltimore and chose to take the water taxi to Ft McHenry, where Frances Scott Keyes penned “The Star Spangled Banner.” So much history here on the East Coast. 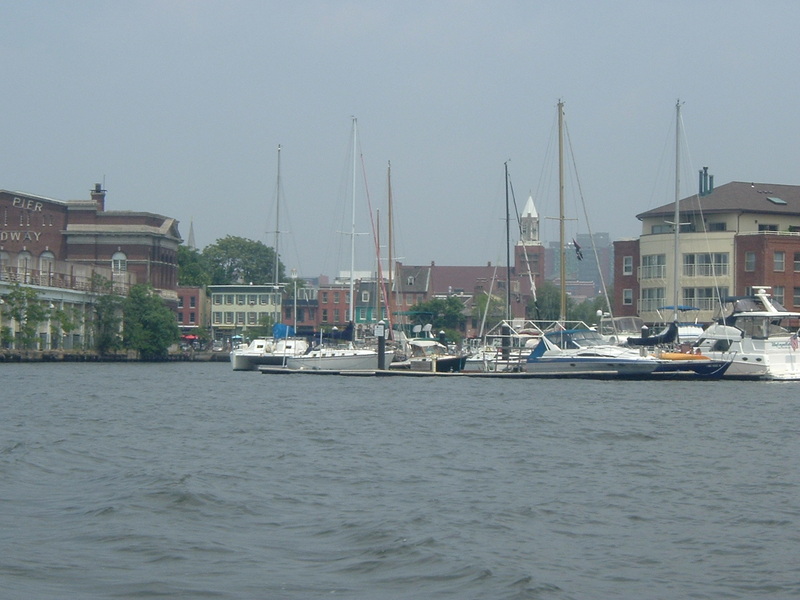 The Inner Harbor is great and so much to see and do. There was a great surprise waiting for us when we arrived at the game. This just so happened to be the day the Orioles were celebrating the 40th anniversary of the 1970 World Champion Baltimore Orioles Team! Whatta treat! The first clue something big was going on was arriving at the stadium and encountering a line of fans that encircled half of the stadium, all waiting for autographs from former Oriole players. The entire 1970 team, or a representative if they weren’t available, was introduced to wild enthusiasm and applause. The first pitch was thrown out by none other than Jim Palmer and Brooks Robinsonson, live and in person! The game? We were so anxious to get out in the ballpark, we grabbed a hotdog and lemonade and found our seats about an hour early so we could watch all the fun stuff, which we did! But the clouds swiftly moved away and we found ourselves baking in 98 D weather with what had to be 98% humidity! Ugghhh……Slathered on more sunscreen and put on our true fan stripes and watched a great game. Baltimore started out with a 5-0 deficit which is always hard to take for the locals. 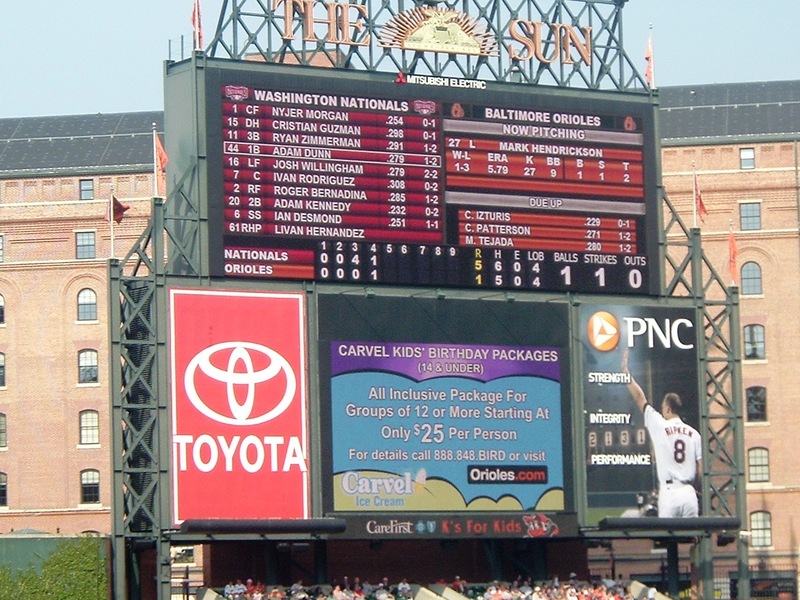 (I consider myself a local when visiting a ballpark but never fail to cheer for a great play, no matter which team makes it, much to the consernation of some of the die-hards). But not to worry. 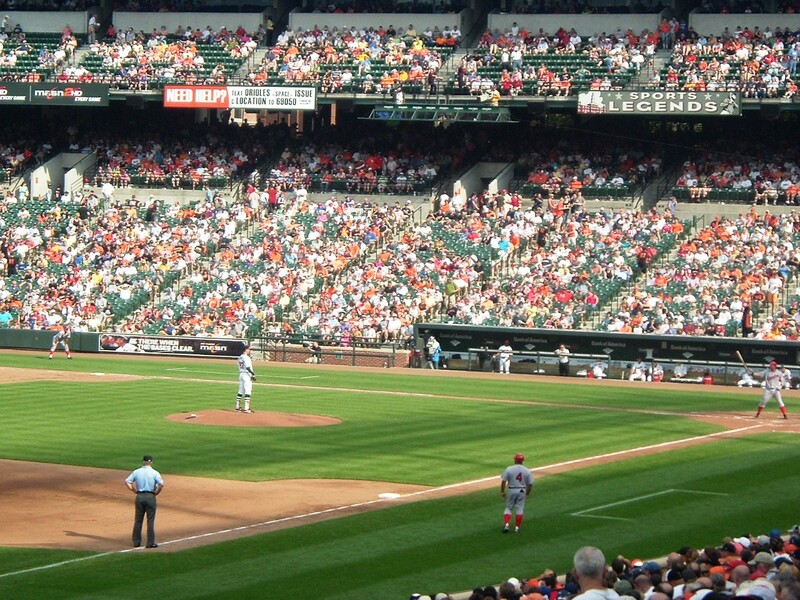 The Orioles made an amazing comeback and ended winning the game with an amazing 6-5 score. The ballpark food was rather secondary today, because, honestly, after that amazing crabcake feast the night before food wasn’t our primary focus today. (Refer to my May 25th blog for this great recipe!) Okay so now it’s 12:30AM and we’ve been informed the bus pulls out at 8AM sharp ~ Destination Citifield Park, New York City! This entry was posted in A1 Baseball, General, A2 Ballparks, A3 Ballpark Food, Baltimore Orioles, Washington Nationals and tagged 1970 world champion baltimore orioles, BALTIMORE ORIOLES, camden yard, g & m seafood, MARYLAND CRABCAKES, oriole park, washinton nationals. Bookmark the permalink. We enjoyed reading about your experience in Baltimore. Sounds like you’re having a great time. Looking forward to the next entry in your blog. We’ll have to have those crabcakes! I’ll put it on my list of things to do when I get home! Thanks for the comments. 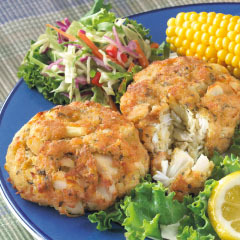 Love those Maryland crabcakes. Mike’s daughter lives outside of Baltimore and when we were back there I always had to have my crabcakes. None as good as the ones you had, they sound extra special. Anyway you all have lots of fun. Well to describe them as “melting in your mouth” is pretty accurate I think! Thanks for the comments! Ditto! The crabcakes were sinfully delicious (you know, the kind that makes a glutton out of the eater). I have to say- I loved Baltimore. The whole experience.